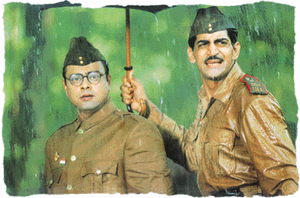 Netaji Subhas Chandra Bose: The Forgotten Hero is a valiant attempt to capture the freedom fighter’s life and charisma on screen. Deepa Gahlot catches up with the veteran director. The biographical picture is not a popular genre in Hindi cinema, while three of this year’s Oscar-nominated films were based on the lives of real heroes. Among the various tourist delights that Jaisalmer offers, the carved havelis stand apart. The stone carvers of Jaisalmer have transformed these huge mansions into exquisite works of art. The Chichen Itza pyramid, or El Castillo, besides being one of the greatest monuments, also indicates the occurrence of a spring equinox. At the exact time of the spring equinox (vernal equinox in astronomer’s language), the rays of the sun highlight a plumed serpent, which seems to slither down the steps towards the well of sacrifice. Nestling in the foothills of the Eastern Ghats, with a natural harbour formed in the Bay of Bengal and beaches, Vishakhapatnam has lots to offer. One can begin exploring the city by going up the Simhachalam temple nestling on the top of a hill, 26 km from the city. Until recently, the script ran the other way round. The promise of big bucks and international fame had always been an overwhelming allurement for Indian actors to taste foreign shores. But all that seems to be changing now. Women from Pakistan, India and Bangladesh write on the Partition of India. Ed. Ritu Menon. Women Unlimited, New Delhi. Pages 202. Rs 300. The Lion and the Tiger: the Rise and Fall of the British Raj 1600-1947.
by Denis Judd. OUP. Pages. xiv+234. Rs 345.
by Gurdial Singh. Translated by Rana Nayar. Katha India Library, New Delhi. by Sangkima. Spectrum Publications, Guwahati and Delhi Pages 299. Rs 550. City Flicks: Indian Cinema And The Urban Experience. Edited by Preben Kaarsholm. Seagull Books. Pages 274. Rs 300.